…we are rooted in the mindset of the 1970s, blissfully unaware that a new reality has dawned. Let’s look instead to cities that lead, cities that are reinventing themselves as places where people live because they want to not because they must, places that are remaking themselves in the image of a human being, not a car, places that offer quality of life not just low taxes. Cities as disparate as New York, London, Stockholm, Copenhagen and now Sydney, Australia, are moving to reclaim their public realm for people. Historic squares that were turned into parking lots in the years after World War II are now being returned to pedestrians. Café life in Copenhagen, for instance, which didn’t exist 40 years ago, now flourishes. And, yes, they know what winter is. Vancouver is, of course, the city that cancelled its Sundays only closure of Commercial Drive – becuase the local merchants complained of reduced takings. It doesn’t help that we have fallen 25 years behind the rest of the world in public transit, which alone has seriously harmed the GTA’s ability to keep pace. Now we are desperately trying to catch up, but many fear the (high-speed) train has already left the station. Indeed I heard a clip on the radio today of Bill Clinton, speaking to a rather less than sold out house at the CNE, about how great Toronto is. Perhaps this is the problem – for them and us. Americans keep coming here and telling us we are doing better than they are – but that is not much of a test. Hume talks about becoming more competitive internationally. I think we should do it even if we don’t attract any more visitors or footloose investors. We should do it because we care about our own well being, our own environment – and that of the world we inhabit. Indeed this push for economic growth is what is driving us to extinction. Building a freeway that will put an end to Burns Bog – paving over Delta farmland to store empty containers – increasing the number of single occupant vehicle commuters along the Fraser Valley and (probably) throwing billions at a tube to UBC when most of the region is starved for decent transit all seem to speak of “the mindset of the 1970s” – before the first oil scare of course. UPDATED: Here is the new video from Translink – showing how to do it. Also has a representative from the supplier – Cubic – present. Kelly Sinoski of the Vancouver Sun demonstrates that it is on fact possible to buy a ticket on the Canada Line with a debit card. It takes her two goes, and even on the “successful” run, it seems to have trouble accepting her PIN number. There is video, but the print story seems more representative of the daily reality. Regular users now carry cash. This, of course, has been a story since Day 2, which is when I first encountered the issue myself. Translink has not covered itself in glory over the way it has handled the story. Blaming the users is of course the easiest thing to do, but it does not buy you any friends. It also seems true, given the continuing volume of complaints, that perhaps the instructions on the machine are not exactly specific enough. There was no mention on the machine of what the yellow light means or “wait for the click”. The machine did say on its own screen “wait for instructions” but there were none and apparently leaving the card in while you wait for them sends the machine to default “invalid card” mode. After all, we all dip our cards into ATM machines all the time. There the machine retains the card during the transaction, so perhaps opting for the “swipe on the way out” technique was a bit contrary. But we also swipe our cards at various point of sale systems – and I have even managed to use my chip enabled VISA card in one or two places. Something they have been doing in Europe for years. That is why these machines were bought – though it is not actually reading chips yet. It is still reading the magnetic stripe. Or rather, not reading the stripe. Translink has changed its tune a bit, and now says that new instructions will be available. Next week apparently. So perhaps their original claim that users were not reading the instructions was wrong. I cannot understand how they expected anyone to read instructions which do not appear. What seems to be missing completely before the release of the Translink video was any mention of where the machines come from, or any comment from the supplier. Cubic supplied the machines. Note too that nowhere on the machine was there any message about the lights – and nothing came up on the screen either. Also missing now is any mention of the “wait for the click” that InTransitBC staff were telling people at the machines. re:palce magazine regularly links to my stories but I have not really paid a lot of attention in return. So I am pleased to draw attention to a post called “Pedestrians need their share of the road” written by Jay Ameresekere and posted yesterday. It is inspired by an article in The State of Vancouver titled Vancouver needs a pedestrian advocate says SFU professor. Anthony Perl takes the City to task for taking pedestrian space for cyclists. What I think is missing from the analysis in re:place is a reference to pedestrians in the rest of the region. The City of Vancouver covers a small part of the area and only a quarter of the citizens, and pedestrians get ignored in most of the suburbs. He also said revenue from new Canada Line riders plus the savings from running fewer buses will be enough to cover its payments. I added the emphasis since it is the first time that I have seen a public admission from Translink that cuts to the bus fleet were part of the strategy. Of course I have been saying that all along – and so have the CAW in their recent campaign. But the public stance of the cheer leaders has always been that bus service would now be so much better since the Canada Line would free up resources to be moved elsewhere. That’s true to some extent, but the impression given was that it would be 100% switched when it is now admitted to be less than that – and probably quite a lot less. Though you would probably have to be an insider to get access to the data to prove that contention. Just like Hardie could not say exactly what the subsidy payments to InTransitBC are going to be. It’s public money they are spending so sooner or later it will be found out: just not while we are celebrating, eh? If you enjoyed the celebrations – or missed them – the Buzzer has more photos of the opening day. They, naturally, don’t link here or to my flickr stream but over 50 people did take a gander at my pictures, even if they were of the second day. There is also an effort by transit geeks to record the last few days remaining of express suburban service in Vancouver. If you have a digital camera or camera phone there are still a few routes not represented at the time of writing. The CBC notes the decline of US tourists to BC, which takes the shine off the new second Amtrak train – which now runs to Portland not just Seattle. (This had been a running story here for some time) They also record cuts to Greyhound bus services, which will hit some small BC communities hard: I had mentioned Greyhound in my recent piece on not competing with commercial services, but it may soon be needed that some public provision is needed to keep up basic connections. Not that there will any money to do that of course. The title is taken from an opinion piece on the Straight’s web page forwarded to me by reader Mike Harridon. It is written by Elizabeth Murphy who “has a background in development and urban land economics and has worked in the private sector, for the City of Vancouver, and for the Province of B.C.” She also seems to be able to conjure up a great deal out of very little evidence. It is a long article, and I won’t quote much from it, but you need to read the whole thing to get an idea of what she is concerned about. I am not saying she is wrong – with this government who knows what they think they can get away with. I just think she is probably over reacting. And anyway who can we say “No” to? Neither Translink nor the Provincial Government listens to citizens concerns. She takes one diagram out of Transport 2040: A Transportation Strategy for Metro Vancouver, Now and in the Future and from that concludes “The province has effectively given TransLink authority over land-use policy plans at the regional and municipal levels.” It seems to be to be over reaching. I take the diagram to mean that the province sets the overall transportation and transit strategy for the province, and then Translink translates that into a 30 year transit plan for the region and has a dialogue about it with Metro. But, as she says what the arrows are supposed to mean “are never explained”. If I had not already recently disposed of Harvey Enchin’s similar fantasies, I might have disregarded the rest. But I read carefully and also looked at the references, and I still cannot come to the same conclusion. 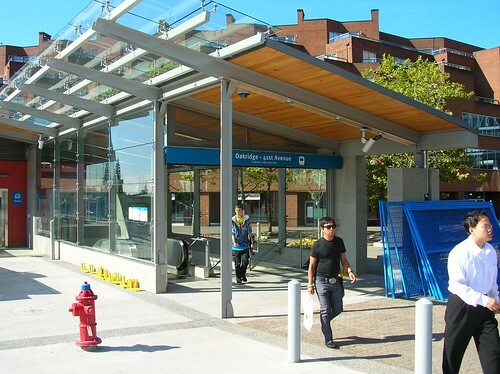 But perhaps that is because I spent a few years in the GVTA (the SoCoBritCA predecessor that also used the Translink identity) wondering what we had to do to get legitimate transit concerns about major developments considered either at the regional or the municipal level. Becuase the old GVTA Act said they had to consult and they didn’t, and wouldn’t. And since the GVTA was then run by a Board composed mostly of Mayors and some other councillors no-one in the management really had any desire to tackle the issue. So it simply got ignored. She is absolutely right to be concerned about “the Undemocratic Nature of TransLink and Its Transportation Plan”. And I agree that “the Proposal to use the Hong Kong Model of Funding Transit through Real Estate Development is Problematic”. 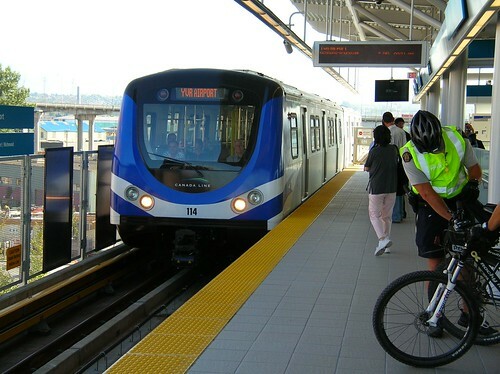 Actually the main problem I see is that in the current market there is little chance of Translink making much money and a great risk it will end up, like the City of Vancouver, in trouble with a development like the olympic Village. For instance, to raise only $15 million toward funding one SkyTrain station in Richmond at Capstan Way, 16 towers were proposed. That project has since fallen through because of the economy and the financial crisis. Translink was not part of that development of course, and the developer had promised to pay that sum to get a station near his development, then backed out of the deal when it looked like he would have trouble selling the units. That is quite different to Translink buying land to build a line, which it then pays for out the development on the bits it doesn’t need for stations. Which is what I understand is the Hong Kong model. But then she goes on to state “Metro Vancouver’s 2040 Regional Growth Strategy Proposal Implements TransLink’s Hong Kong Model of Development-Funded Transit”. No, I do not think it does. It says, quite properly, that future density needs to be served by better transit and concentrated at transit nodes or along transit corridors. That is just good planning policy. But Metro has absolutely no way of making the municipalities actually do anything. We saw that with the previous LRSP. Each municipality had to get the GVRD’s endorsement that its OCP was compatible with the Regional Growth Strategy, but once that was done, what they decided to do on Monday night when they looked at development applications was up to each individual municipality. And in BC there is no appeal of a municipal planning decision – not to the region or the province. The Regional Growth Strategy said nothing about Office Parks, for instance, but did say employment should be concentrated in the regional town centres where they could be served by mass transit. Except most of them weren’t and very few developers wanted to put up expensive towers near the transit lines. They wanted to put up cheap low rise buildings with huge parking lots near the freeway entrances. And that is what most municipalities allowed as they needed the property tax revenue. I happen to think that Frequent Transit Development Corridors as proposed in the Regional Growth Strategy are a very good idea – but that doesn’t mean that even if Metro endorses them that we will necessarily see them happening. Only if enough developers buy in to the concept and municipalities decide to let them. Which I think is actually the case at present. Allowing them to develop the sites they own to produce transit oriented development seems to me to be a much better idea than the current practice which produces places like Sexsmith park and ride or Phibbs Exchange which seem to me to lack basic urbanity, but could be quite good places if developed properly. They might even make money, but right now I would regard that as a possible bonus not a secure source of funding for transit growth. But also I think that we need a different kind of regional authority or government. One that actually has real powers over transport and land use – as well as other regional services like sewers, parks, waste disposal and all the rest. That would combine Translink and Metro as one directly elected body, accountable to the people of this region and with powers to both borrow and to raise taxes and levy charges. Metro as it currently stands has no power over planning: it tries to achieve consensus which means we go no faster than the slowest – and we cannot afford that any longer. We need to change, and change radically, to a sustainable region which means more transit, denser development and no (expletive deleted) freeways! The chances of that happening here now are slim to none, and we will suffer for that. But eventually we will have to embrace this notion or we are doomed. Business as usual is no longer an option. And I think that is really what Elizabeth Murphy wants to return to. I really doubt hat there is any substance to the idea that the province thinks it can control development through Translink. And anyway it doesn’t need to. It is already influencing future development patterns by picking its preferred transit lines (Canada Line gets chosen over Evergreen is a purely provincial decision) and by expanding the freeway. That and the SFPR have pretty much set the pattern of development across the region for the next forty years – and it is not going to be transit oriented. Langara College and Capilano University were added to the program only in May 2008 and January 2009, respectively. I wish I could find where I made that comment but I cannot track it now to correct it. The self absorption of students on this issue never ceases to amaze me. They talk about why students need more subsidies and why they ought to get them, but there is never any reference to all the other people who may actually be more deserving of public support, or what other legitimate claims there might be for transit service provision. Now for campaigners that is understandable, but when it comes to a “thesis for a public-policy master’s degree at SFU” I expect a lot more objectivity. The headline comes from a Georgia Straight article by Carlito Pablo which is also somewhat one sided. It is acknowledged that “TransLink is in a financial sinkhole” – in other words it simply cannot afford to extend U-Pass to other students let alone people who have graduated – up to five years ago! But no one seems to mention that when university graduates do get a job, they tend to be better paid than the rest of the workforce. I recognize that right now the jobs market is unusually tough for graduates – but then that is true for everyone trying to get a job. And yes there is also under-employment in the first year or so of the new graduate’s career. But that is not the transit system’s problem. In fact, I argue that social welfare is not something that transit systems are set up to deal with. Concession fares are essentially marketing tools, not methods to correct maldistribution of income. There was – when I worked there – a small program, fully funded by the provincial government, to give free transit tickets to the indigent. I say was because I simply do not know if that has survived the BC Liberals meanness in social policy. Certainly Translink and BC Transit have no way of determining the income of its users and adapting fares to what they can afford. 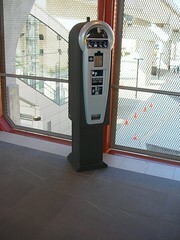 Most people pay the same fare, and the ones that get a break are due to some special initiative or other, like U-Pass. Quite why students get to the front of the line of people who want a break on the fare is not something I feel comfortable discussing. Mainly because I think there many more deserving causes like single mothers on welfare or people with disabilities who cannot get around any other way, and who for as long as I have been aware of the issue do not get anything like the number of rides they need. Most recently I was asked to support a group that wants fare concessions for school children to take field trips. Everyone has a good cause. But it is also the case that basic transit service is inadequate now – overcrowded and underprovided – but will be cut heavily if Translink cannot get more funds. It is bad enough students pushing themselves to the front of the line when times are good. Doing it now just looks greedy to me. First priority for Translink is more revenue to keep existing services going and, for a whole range of reasons, expand the system significantly. We do not actually need any program to encourage ridership. What we have seen is that as transit service improves in frequency, range and service speed is that people do use it, and the system can win people out of their cars. Indeed, one of the findings that Brian Mills report cited was that the soon to be withdrawn #98 B-Line attracted new riders to the system, not just people from other bus routes. So it is perfectly possible to get people out of their cars – and it does not necessarily have to be very expensive, grade separated railway to do it. In fact, it is probably worthwhile someone doing a comparative cost benefit analysis. 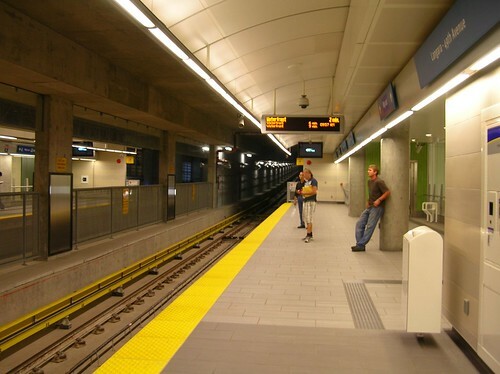 How does the cost per new rider compare between the B Line and the Millennium Line now – or the Canada line in a few years time? It is a pity that his point was not made years ago by staff at Translink who stuck to the line about “revenue neutral” U-Pass prices in their Board reports and failed to calculate the impact on costs. 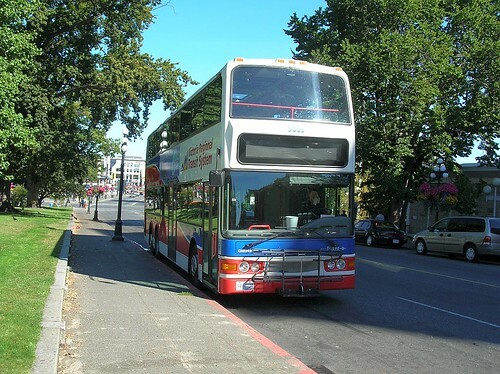 The story at CMBC since the U-Pass was brought in has been a constant struggle to get more service onto SFU and UBC routes, and that has cost plenty. B.C. Transportation Ministry spokesperson Linda Gold said the government is “still moving forward” with a provincewide U-Pass program for September 2010. “As far as details about costs and things, they haven’t determined that yet,” Gold told the Straight by phone. The government is desperately trying to maintain key services, but a $3-billion shortfall is making that a real challenge, Hansen said. “We are desperately trying to maintain the critical services in health care and education and the social services. So it’s definitely been a challenging summer,” the finance minister said Wednesday. “Maintain health care” of course means significant cuts already in surgeries – but that is the current year. No doubt it will be worse next year. Of course, with this government’s priorities being quite different to mine – or indeed most people in BC (see recent poll data) there is no telling what the new budget may say. “It could translate into a larger deficit, higher taxes or more program cuts” observes the CBC unhelpfully. Probably all three I would say. I doubt that one of the program cuts will be the Gateway, but stopping the Highway #1 expansion would save $3bn off the bat. Not much chance of that. But you can bet that the arts, libraries and school field trips will be first in line for the chop – as well as “elective surgeries”. So if your granny has been waiting for a new hip, she can expect to spend a lot more time in great discomfort and very limited mobility. Because making sure the Olympics are a great PR success is a lot more important. Quite where the “commitment” to U-Pass stands in all this remains to be seen, but it does not seem likely to survive – any more than any other BC LIberal promise made three months ago will survive. They are in power now and can go for four years before they have to worry about promises again. What appears to be an article in the Times Colonist is uncreditted, and reads like a letter to the editor from an all ill informed reader. A journalist writing such a story would at the very least pick up a phone and call Translink’s press office. There is no express service from the Ferry to Vancouver because of a long standing agreement with Pacific Coach Lines. They operate the coach service between Victoria and Vancouver which gets carried on the ferry. This service is commercial so fares are higher than transit as there is no subsidy. People are prepared to pay more for the greater speed and convenience. Translink (and its predecessor BC Transit) agreed not to run direct bus services between the ferry and downtown as that would abstract PCL’s traffic. Using public funds to compete head to head with private companies is not allowed. The existing #620 is a distinct improvement over the old #640 – which required Vancouver bound passengers to change at Ladner (although you could still do that and get a #601) but most people currently ride all the way to “Airport Station” and change there for the #98 B-Line or the #424 to the airport itself. Increasing ferry fares have had the effect of encouraging walk on passengers, with a considerable rise in the number if drop offs and pick ups at the terminal in private cars (“Kiss and Ride” in US transit parlance) but also of transit use. 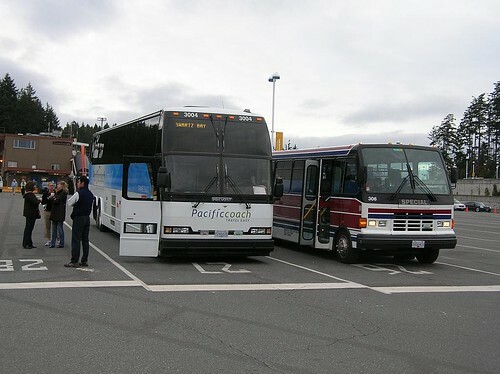 BC Transit does offer express service to downtown Victoria from Swartz Bay – quite why they are not covered by the PCL non-compete agreement I do not know. CMBC has on occasions put on express services when loadings were exceptionally heavy – presumably when PCL was overloaded too. There is also the argument that transit subsidies are not intended for inter city travel, but solely for travel within the transit operation’s boundary. Cross boundary services with neighbouring operations were always regarded with caution. After all, Greyhound gets no subsidy for its operations – which is why fares to so many small places within BC are so high. If we actually cared about greenhouse gas emissions more than private sector profits then these policies might be reviewed – but don’t hold your breath on that one either. As luck would have it, I had to go to the airport today to pick up a package. So with that in the trunk, I drove back to River Rock casino, where I parked. I was pleasantly surprised to learn that parking there is free at present, even though they have the ticket machines in place. They are just not switched on. When they are you simply have to remember your parking stall number and tap it into the machine. $2 a day charges will start on September 7, but right now it is a great bargain. There are signs up saying “No YVR parking” though how they would enforce that beats me. There is a lot of parking at the Casino – and of course they do not want to deter patrons, but just across the Middle Arm at Templeton Station (the next one down the line) will be a huge long term parking lot for the airport. That will cost more than $2 a day – but the train ride will be free. The extra fare to go from Richmond and Vancouver to the Airport is also temporarily in abeyance so how this all works out will be interesting. There were none of the crowds that wanted a free ride yesterday. I still think that Translink’s system wide $9 day pass is a great bargain. Yes I could have bought a two zone ticket and used it for 90 minutes – plenty of time for a round trip, but I did not want to be hurried. Conversations with other passengers (my word I am becoming North American) confirmed that many were doing the same thing I was. I rode from Bridgeport to the airport in the back of the train, so I could then get the “driver’s seat” on the way back. I had, of course, been inside the train when it was on display at the Lansdowne station open day. But running is the real test, and I must say my first impression was very favourable. The Rotem train is much quieter than either a Mark 1 or 2 SkyTrain – I think because it does not have the linear induction motor with its characteristic howl. All the track is long welded, so there is none of the “clickety clack” of old fashioned railway track, and even over switches the ride is smooth and quiet. The seats are not well padded or cloth covered, but since rides are short and smooth this is not an issue. There is plenty of leg room, with the exception of the end row of seats – and there is a rush for the two that have a view. The corner seat is shunned as it has no view front or side. Though I imagine if you are regular commuter with an ipod and a book you will be happy to be isolated. The stations are rather bland and featureless – all muted beigey colours. There are as yet no adverts – though frames can be seen in many places where they will be installed. 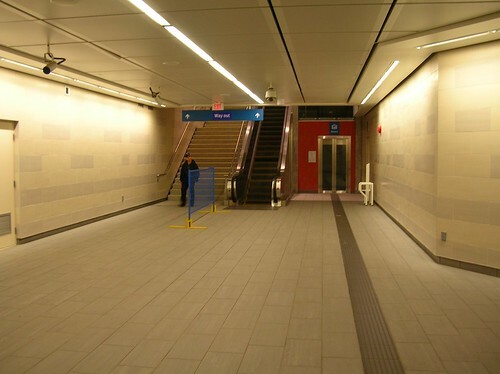 I think the stations have a distinctly inoffensive Canadian look – very much like Edmonton’s system. They are currently spoiled by the relics of crowd control from yesterday, and the interiors of the stations will look much better once the temporary barriers are removed. I saw no staff on board any train this morning, they seemed to be at the ticket machines – which seemed oddly unreceptive to my collection of payment cards (credit and debit). I am glad I had some cash on me. There indeed passenger counters – they are, one attendant told me, lasers and are concealed in the direction signage. I rather think infra-red is more likely but no doubt those who are always quick to correct my assumptions will jump in. Which brings to the extendability of stations. I poked around a bit and now I can see how it is possible to add ten metres of platform even in the underground stations. That will allow a twenty meter centre car to be added, with the ends of the train within the tunnel but all doors against a platform. So no extensive rebuilding but, as with the surface stations, not exactly cheap or quick to do. Again, we will need to see the P3 details to understand how that gets paid for but obviously there is only one source at the end of the day. So fares and taxes will pay for it – but it might be spread out a bit if done early in the life of the deal. What is less easy to see is how the line capacity can be enhanced because of two long stretches of single track at Brighouse and YVR. The former is also a barrier to further southward extension no matter what happens from Granville to Williams in the way of additional density. What this means is that train frequency can be no more than the time it takes to turn back a train. Present working seems pretty smart and dwell times at terminals are not lengthy. But once trains get crowded, and the airport passengers bags started impeding the fast walkers … well, we shall see. Right now, as I advised one German visitor carried past his stop (Roundhouse) it is no real inconvenience to just stay on and get carried back. So when I boarded my return train at Vancouver City Centre (actually located at Granville and Georgia) I deliberately went the wrong way again – just so I could get the best seat. 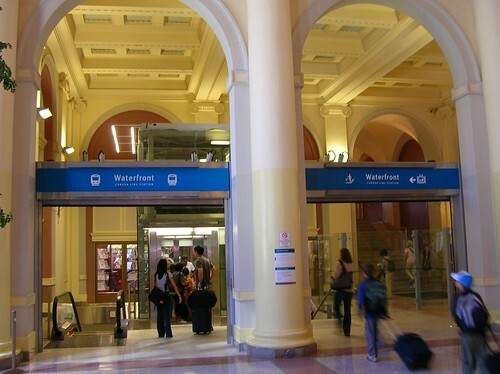 Waterfront station has two tracks and a crossover, so can clearly handle more traffic. Only one track was in use this morning – with a spare train parked in the other. The walk from the end of the platform into Waterfront Station is level, and enlivened with some large monochrome photographs taken during construction. I would like to see many more of works like this or similar art on the blank walls of the other stations. Of course, in London these have always been prime sites for adverts, though in recent years art and other design elements are more often seen. Perhaps the finest being the stations on the Paris Metro which serve the Louvre. It’s like being in the museum itself. That is another comparison that occurred to me. In many cities the metro has a strong corporate identity – a symbol instantly recognised. In Vancouver you will see many stores have decided to adopted London’s ring and bar sign for their own use, obviously unconcerned about copyright. Vancouver stations have none of this – and frankly not much street presence either. I recall very well a developer telling me, when he was explaining why he wanted an LRT for docklands and not an extension of the tube “I can’t sell a staircase on a street corner”. Which is a reasonable description of City Centre station. It is integrated into the Pacific Centre below ground. But Oakridge is not. There the need to get under one set of running rails to get to your train is awkward (a bit like Yonge Street at the old Eaton Centre). No doubt there is a long history there, but I do wonder why there is that great empty plaza on the corner of Cambie and 41st. So now here is the evening peak experience. Trains were lightly loaded this morning, and platforms quiet. That was not the case between 4 and 6pm. Even so it was clear that there were quite a lot of sightseers, and some commuters who were distinctly grumpy that their train home was also a source of entertainment. People were also very reluctant to leave the seats with the best forward view. Judging by the number of people who did not get off at Brighouse, tourists were at least 40% of the load on my train. On the whole from a scenic perspective, if you don’t care which train comes first, YVR is a better ride. Richmond along No 3 Road is just not that interesting. The view northbound will be spectacular when we are not subject to warm weather and white haze cloaking the mountains. But the centre of Richmond is basically parking lots and low rise, tip up buildings, designed to be cheap and have a short life. A few tower block offices around Westminster Highway must be feeling a bit overlooked – but they all have their blinds shut against the sun anyway. The surface stations of the Canada Line are even less remarkable than the holes in the ground. They are clearly functional and there are some recurring themes, like the swooping roof curves seen everywhere – from Waterfront to Brighouse. Which is an odd choice of name – why not Richmond Centre which is what the buses have on the front? Most local Richmond routes ( according to the current Buzzer) will intersect at Brighouse – Bridgeport being the “regional centre” for the Highway #99 routes. I can see this being a point of discord in future as ridership gets near capacity. People from White Rock and Tsawwassen will find the trains from Richmond are full – at least as far as seating is concerned. So it is probably just as well that peak use from the airport is unlikely in the early morning. The express buses are, of course, still in downtown for the next two weeks, and are still the preferred majority choice I would say. And of course if you are going beyond Richmond the only choice for many. Sexsmith Park and Ride is also still pretty full, unlike the casino’s multi-storey. According to the CBC news tonight, the ticket machines on the Canada Line have new “chip technology” which is supposed to explain why none of my cards were recognised – even the ones that have chips! I get the distinct feeling that the editorial line at the CBC on the Canada line is one of celebration – and much was made of the reported 100,000 people who used the line yesterday. They are simply not interested in a critical appraisal. One thing I did notice was the the Canada Line has overcome absence of the cell phone signal in the tunnel that affects SkyTrain. I am not at all sure that is a Good Thing – because I really do not like to be an audience to conversations which ought to be private – and in many cases are not in the slightest urgent. And since many of them are in Cantonese – which always sounds like they are having an argument – eavesdropping is out of the question but disturbing the peace isn’t. It is pointless reaching any conclusions about the Canada Line at this stage. It was not the highest priority, or the best choice, but we are stuck with it. Rather like the Millennium Line. But probably a bit more useful. If the Casino parking price stays at $2 – and is available in the evening, when you only need a one zone ticket – then the time and cost of driving all the way or park and ride is about the same for me. So I will probably use it when I go downtown. 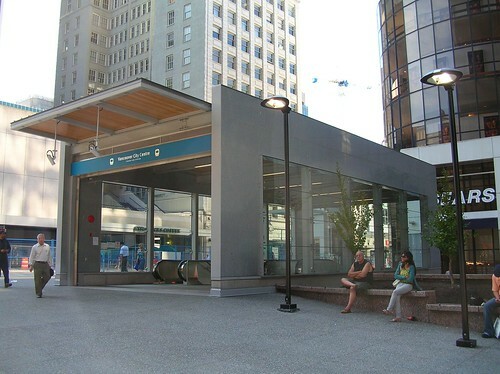 I doubt that I can be tempted to use the local bus though, simply because late at night (which is when I tend to be coming home from downtown) the last place I want to hang around is a bus loop – or Richmond Centre. And it is unlikely that service frequencies will get much better off peak – despite some quite heavy loads when there are events on. I did see one in station refreshment place going in – Jugo Juice will be at 41st – but then there are already places just inside the Oakridge Mall like that. There is no sign of any services at the Richmond stations apart from a cabin type building that could be a concession – or more likely a driver’s rest room.